A short review for a game that needs no introduction. Daytona is like some kind of Sega racing game shrine. Everyone has played it, everyone has enjoyed it. Sega know this and have released a revamp version. Many of us maybe wondering why Daytona 2 was not released. I can only assume that it is due to the original being more 'realistic' i.e. you do not race around a space base. As with all Sega racing games we have always had to make do with racing around mirror and reverse mirror versions to boost the lastability, well it is the same again. 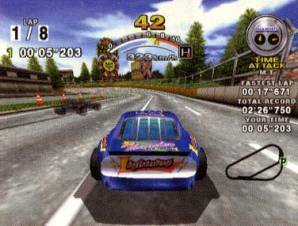 Daytona USA 2001 features the original arcade tracks, and a couple from the Saturn only Championship edition with 3 brand new tracks which keep the Daytona magic. I am a fan of racing games, and Daytona USA 2001 is definitely a racing game. The feeling of racing against 39 other competitors is amazing, something which the likes of MSR and Gran Turismo can not match. With 40 cars going around the track at the same time, you can expect that the graphics will not look amazing. Well you are wrong�sort of. The graphics look great, in an arcade sense, but this has always been Daytona's charm. You will spend most of your time in the championship section as this is where you have to finish in a certain position to advance to the next championship tracks. You reward at the end is a new car, which is the fastest thing ever, but is tough to handle. All the pop up in the Saturn version is non-existent and you can finally experience the enjoyment of the original Daytona in your home. Daytona USA 2001 controls will take a lot of getting use to. First the car only responds to the analogue stick, so you will get the impression that the car is driving a little bit erratically. With time you will find a good setup and this will all be forgotten. The car setup screen is easy to navigate, it basically falls down to tyres and transmission. Soft tyres for more grip, hard tyres for speed. The different cars only prove to be of use in the later tracks, the level of customisability is just right, any more would have altered the whole game feel. Daytona is an arcade racer not a simulation exercise, although you can still win racers by driving well, i.e. slowing down for corners then accelerating out of them, most of us will be power sliding around the corners like we are MAX power readers. Daytona USA 2001 has a split screen two player mode, something that was sorely missing in the original Saturn version. In this mode you race around the same tracks with no obvious loss of graphic quality. Finally we come to the music, something which we all would have heard sometime. The classics like 'Rolling Start' and Daaayyytona lets go away' are back and sounding better than we remember them. The new track music is more ambient and works just as well. Daytona USA 2001 is something of a Sega landmark more so than Sega Rally, Daytona USA is the true arcade racer which is now available looking better than the arcade on your DC. 7 True to the arcade original, except better! Sound 8 Those cool tracks are back, we all love them in a camp kinda way. The car acceleration sounds are spot on too. Gameplay 10 It's Daytona, there should be some kind of special holiday to commemorate its existence. An arcade racer with little more than arcade thrills. Instantly playable and fun. On-line racing proves a nice distraction.